These all-American return address labels make a great addition to any home or office. We've taken the classic U.S. Flag and added a stylish border to give your labels an edgy, weathered look while still respecting Old Glory. These self-adhesive labels will look great on envelopes and packages when placed opposite traditional American flag postage stamps. If you're sick and tired of scribbling your name and address on all your outgoing mail, here's your chance to win a little extra freedom during your day! American Flag Address Labels from CheckAdvantage make a routine task fast and easy! 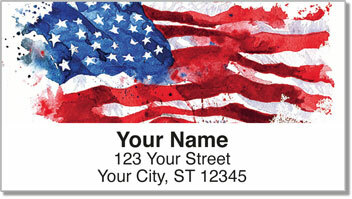 Get your very own American Flag Address Labels today! Complete your order with patriotic American Flag personal checks too!